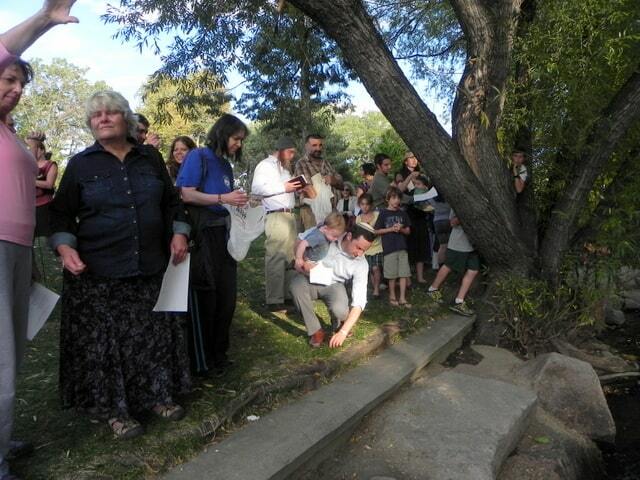 JT21 (Jews Together in the 21st Century) held a Community Tashlich ceremony at Boulder Creek in Central Park near the Broadway underpass on Wednesday evening. Presided over by Rabbi Gavriel Goldfeder, Rabbi Marc Soloway, Rabbi Josh Rose and Morah Yehudis Fishman, about fifty members of the community, including many children and babies, took part in the brief service. Consequently, Jewish communities have for many generations gathered on the First Day of Rosh HaShanah at bodies of water and recited the Tashlich Prayer, which consists of certain chapters of Tehillim (Psalms) and the verses shown above, to symbolize our wish to get rid of our sins, and to be forgiven by G-d. Some have the custom to throw crumbs, but some authorities say that one shouldn’t; each person should act according to his/her minhag. Historically, Jews would sometimes be instructed by their own community leaders to seek out bodies of water not near the center of town, so as not to be seen during Tashlich by their non-Jewish neighbors, for fear of a “poisoning the wells” accusation. This was certainly true if actual food was thrown into the water, but even if not, they would be accused of mumbling curses and poisoning the wells by witchcraft.